In Part 1 and 2, I explained how to simplify managing your money. If you have not read them yet, please Click Here to read up on what you’ve missed. In this article, I will finally explain how to increase your “take home” per month without adding any additional bad expenses for you! For those who have No Income Stream at all, then good news, this article will help you get started on your first income stream. Now for those who have a Main Income Stream already, you must Keep and protect your Main Income Stream (at all costs) and keep on adding Income Streams to it. Today, I will give you two of the most doable ways to start or add an income stream and explain how to do it step by step. 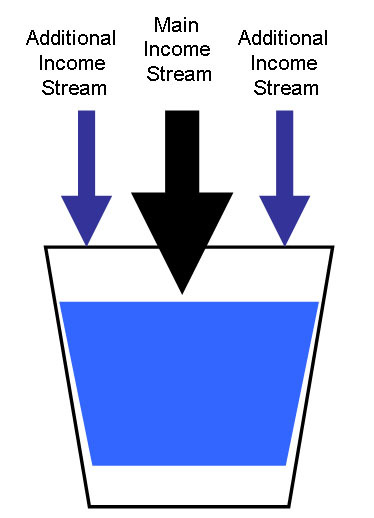 By the way, you are not limited to doing just one of them, you can actually add both streams at the same time! Step 2: Create a price list. Here’s a quick guide on how to do that. Come up with a reasonable price for each item. If the item is new (you never got to use it) then sell it or rent it at current market price (it can also be lower than market price, just make sure that you still make money from it), if it’s slightly used, sell it or rent it 10% – 50% lower again, just make sure you still make money on it. Add delivery costs if you will deliver it. Or you can say prices are by pick up only if you can’t deliver it. Include a nice quality photo of the item whenever possible and remember to make it look presentable. Step 3: Advertise it for free by holding a “Virtual Garage Sale”. -A “Virtual Garage Sale” is very easy to do: Email the list in step 2 to all your friends and tell them that you are selling your stuff and would like them to check out the items that they want to buy. This saves you the trouble of organizing a Physical Garage sale especially if you do not have the space to do so. -You should also try selling your items on www.Ebay.ph , Facebook, even Multiply. Go to the respective websites, open a free account by following instructions and start posting. This is also free. Now, don’t be limited to just these ways, there are lots of other places for you to advertise your list for free, all you have to do is go to www.google.com and type: “Free Directory Listing” then start posting in those sites. Step 2: Pick one skill, test the market, and gain experience by offering to do your first 3 to 5 jobs for free. Here are a few guidelines to doing this right. Start by offering your services to family and friends only and say that you want to try this out first with them. Limit the “Free” service for 3-5 clients / projects and see if this service is something that you would enjoy doing for a fee. Ask for honest feedback from your family / friends about your service and if they would be willing to recommend you to their friends. Get their honest inputs and improve based on that. Step 3: Price it, and advertise it for free by word of mouth and through the Internet. -You should also start advertising yourself on Social Media Sites like Facebook, Multiply, and possibly even start your own Blog to highlight your skills and who you have served. Now these are just 2 ways to start increasing your income streams as soon as possible. There will be more to come in succeeding articles of mine. Stay tuned for that. In the meantime, I hope that you learned something from me today and start building your income streams now. Good luck and all the best! 1.) Scroll down to the bottom of the article and leave a comment. I assure you they will thank you for it as there are lots more articles I still have to post. It is truly a pleasure being able to help others. It makes me feel good and I hope it will do the same for you. Keep Reading, Keep Learning, Keep Sharing! I appreciate this article. Thank you for giving me ways on how to add to my savings. Hello.. My girl friend told me about your blog page. I’m a struggling business man full of ideas & passion.. 🙂 I just don’t know where (more of how) to start. But thanks to your tips, I think I’ll get to that point. Thanks again! Glad to hear that Jerem. Always happy to help. Likewise, I look forward to teaching you more as well. See you in the next article. Welcome Trina. If you have not yet done so, subscribe to my blog at the upper left hand side to be notified of new posts. Also, do share this and other articles of mine on Facebook or twitter so that all your friends may also benefit. Keep reading, keep applying, keep growing! Great Advise Mark on increasing income!!! Indeed there are many ways! If there is a will there is a way! Glad you finally made it to my blog Ella. Been a while! I tried selling online and tutoring before to have an extra income then I stopped because I did not focus on that and I guess that those are not really what I wanted to do… I should start with what I am passionate about, right sir? Absolutely right Glo. Making money is not sustainable if you don’t enjoy doing it. Find that one thing that makes your heart sing when you do it. When you find it, money will flow naturally and without hesitation towards you and you are definitely heading in the right direction of creating wealth that truly lasts. Excellent Glo! You’ve finished all 5 articles in less than 2 hours! How do you feel? I feel great! Actually, I am here in the office and I am not that busy today..so instead of Facebook and reading news online, I decided to read and learn from you. Thank you so much and I look forward for more inspiring articles and tips from you and your wife! God Bless! Good, don’t forget the last assignment in the first week of the wealth plan. Email me what problems you encounter in implementing these lessons. Or what realizations you have once you have tried these lessons in your life. Talk soon! Mark, you are teaching practical ways to do business and make money. This absolutely not being taught in school. Thank you, Mark. Great! Would that be selling skills or selling stuff you own? Brilliant article! Simple and easy to follow ideas to create additional income. Thank you for this Sir Mark. By the way sir, I’ve been thinking on becoming a freelance photographer. May I ask for your advice on what is the best way to tap the market and promote myself especially that nowadays there are lots of talented professional photographers that clients trust more than freelancers like me. Yes, I think you should pursue that. One way is to create a website / blog to get yourself and your portfolio publicized. I think you have a lot of pics uploaded on facebook, create a separate website as well. 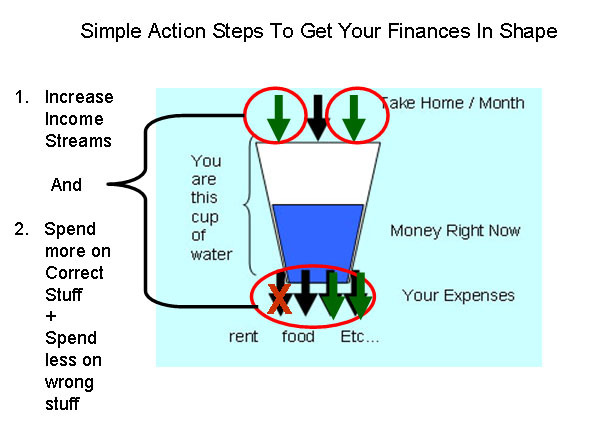 Also, please re-read step 2 of turning your skills into additional income streams as it outlines how to do it. That’s my problem right now. I want to have an extra income but don’t know how. Wanted an online store but do not know how to start it. Mammy, google this phrase: “how do I start an online store?” you’ll be amazed at the stuff you will find. All ittakes is just a little research. Talk soon! In this article, I realized the importance of having multiple sources of income while learning to keep your focus. The problem I had before was I got involved in so many things which eventually led me to confusion. I know a lot of things but I don’t have any specialty until it came to me that I have to focus on my core gift and that is finance and investments. That is why right now, I am devoting most of my time in improving my financial knowledge and focusing only on income streams related to finance. Praise God!!! truly this same with justin i had so many things to do but focusing on my core gift is left behind.thank you so much for a wonderful insight,i will do my very best to change myself and follow ardently your teachings on financial wellness. All the Glory be to our loving God!!! This is really helpful. Must think of ways on how to earn those extra income streams. We’ll surely practice your formula. Thanks. Hi Mr. Mark, I know I can type well and quick that’s why I want to try a Freelance Transcriptionist or Translator sideline. But I do not know where to start. Also for the prepaid loading I have in mind, please advise how should I deal with pay-later set-up? Hi Paul, everything can be googled. You have to do your homework and do research. Google your questions, find answers, then go for it. You gave me some ideas Mark..I think my sis, jobless, can benefit from your advise. Mark, your suggestions are really informative and it opens a lot of doors… so thank you again. hope to have more of your articles!!! God Bless!!! Welcome Robert. Nice to hear from you, it has been a while. This particular articular made me think of somethings like, “how do i make a good expense become a source of income later on?”, “how do i measure if an expense is necessary, unnecessary or bad for me?” , “what other skills do i have to add to my income streams?” I guess, its time for me to do something concrete about these thoughts. Thanks Mark. Having multiple income streams is really important this days where job security is not certain. I’m still trying to figure out ways of having income streams being a stay-at-home mom. good advice. i have never thought of renting my stuff or turning my skills into additional income stream. i will do this things, multiple streams of income. sounds very fun and good of course into our pocket. it’s money money money. yeah boy. good job sir mark. Wow, this is so practical and right now, i want to try it. im good at computer and im thinking of making designs for invitations and typing jobs for school projects..
Hi Mark! Hope you’re having a nice day! This is really exciting! I think I’m going to finish the assignments in Part 1 today. I can’t wait to read the next article. Kudos to you and Jhoanna for this! God bless.. Interesting – additional income streams. Now you actually helped me identify my problem. With expenses, they are fixed necessary expenses, too high: electricity, etc. But I find it difficult, if not impossible, to create additional income streams when my job requires no absences and takes most of my time so that by the time I get home, I’m too tired to do anything. Can’t even talk to my kids or wife anymore. I just drop dead, i mean sleep. As with skills, I don’t think I have any. I’m at my wit’s end. i will try the method of reselling. Thank you for this article. am glad to be in the right track. have applied your tips. Very glad to hear that Faith. Oh yeah! I am really getting the virus.. it’s addicting to write everything.. i didn’t realized, I’ve had so much stuff accumulated in years.. and most are non-value..huhuhu.. But nevertheless, I am glad I ‘ve got a new journey for this year. Super thanks for all these MArk…God bless. May you achieve a debt free existence Ira. Good luck! thanks for the advise mark, i sort of doing that sideline skill for sometime now, keep on giving great business ideas and tips! I greatly like this post… If you will post more. I’ve been wanting to dispose some of my things, now I am inspired kasi I will make money from them! Great article, sir! Thank you for sharing your knowledge to us! Thank you! This is an eye-opener for me. Got a lot of stuffs at home which I can put on a garage sale. Glad to help Marlene. Let me know how it goes. But this might not be possible as the electric guitar alone is worth 30K already. I doubt that people would be willing to put down a deposit that high. Thanks a lot & God Bless! I suggest selling it instead, but if you want to rent it out look at getting insurance for those instruments first that way if anything happens to them you are covered and you can ask for a smaller bond. Very practical ways to add income. I am actually doing some of the ways you mentioned. Great! Doing this step already…BUT! It made me want to add more! Time to re-evaluate mys skills. a million thanks! i’m now thinking for feasibility study in a business some what i’ve figured out before. again, pls pray for us…. Thank you for the practical tips on how to make more money! I have already started by selling bags and some jewelry items which I’ve accumulated when I was still working.I plan to expand this to include other items I still have.Great article! Very good, please update us on your progress! Thank you for the tips on how to increase my income streams. I have actually started selling some of my jewelry items which I have accumulated when I was still in the corporate world.I can expand it to include my other stuff and in the process make additional income and unclog my closets/cabinets.Selling things on line is a good idea.Thanks again! Great, now you can forward this article to all your money leeches. Best! Thanks sir Mark! Knowing oneself and action will lead to more income streams. Gotta work smart! thank you for the tips and advises. definitely gave me an idea what to do next. I actually have other thing that adds to my Income Stream. I am a dealer of a direct-selling company. And I enjoyed it because I identified a “market” in my office. They are the ones who are asking me the brochure. :) Why not take the chance, right? Very welcome Aze, glad you are excited and we look forward to seeing you succeed. best! Good Ideas, I’ll try them out. Thanks. I’m a hoarder and very sentimental about keeping old stuff. Thanks for this post, I realized that being more practical is what I have to be. very simple and practical ideas i just need to apply it on my everyday living please pray for me and thank you for sharing your gift to bless persons like me God bless. Selling those that are useless to me already is a good way of cleaning my closet and increasing income. I’ll also look into being freelance photographer. These are really practical tips to start earning multiple income streams. Everyone, without exception, must have another income stream aside from our main income. Wow! This is great! The steps are clear and doable. Praise God for your talent and gift! Thank you so much for refreshing and reminding me of these principles about money! Your way of presenting them is so simple and doable. It’s a wonderful Week 1! Hi, thanks for providing ideas on how to supplement the main income stream. I’m thinking of taking a course on foreign exchange trading because this is where my interest lies. I want to attend your orientation on this. Please let me know the schedule and the venue of the orientation. One thing for sure, having only one stream of income is not enough, especially if your expenses is big. Sometimes we need to exercise our mind, think on something that would help us to expand our savings and income. Having employed and wait for salary day is not advisable. Look on something that will increase our income. The article is very helpful and definitely doable, especially selling the “good expenses”. Thank you for the nice ideas Mark. Mark, I cash flow is positive and do not plan to generate just any kind of income streams at this time. I am looking basically for what you call ‘exit strategy’. Like you I have traded currency before (FOREX even). I was one of those who did well initially but lost a fortune eventually. I would like to start all over and learn from someone like you who professes to do well in FOREX trading. Thanks for the idea of creating new income streams to add to your main income. Now I’ve to find out what my core gifts are and focus on them to create an additional income stream. I don’t understand why they don’t teach these things in school so that everyone would know how to manage their finances before they face the world. I just need your advise or suggestion. When you’ve a parent who’s bedridden and would need constant medical care/maintenance to stay alive, what would be the best way to handle this situation and still be able to accomplish the wealth plan project for your own family’s future? Thank you for the above useful information regarding Income Streams, I do not have that yet, if having extra cash, I invest it ( medium to long term ) through the stock market. I eagerly await our next series. I am really good at playing guitar. Many are asking for me to teach them but I observed that my guitar lessons are always cancelled. I would like to know your seminar schedules for this sept to dec.2013. Great article! Selling my “skills” is a bit tough for me to do. I feel that my skills are not good enough to be “sell-able.” Looking forward to more tips on how to increase income streams. I have formulated an additional income stream for us while reading on this article. As I have mentioned from my earlier comments, my wife and I has a small business which is website designing and development. There were times that we can even closed a deal at 40,000 to 60,000 but it doesn’t happen right away as it would be needing lots of presentation and time for the company to decide if they will hire us or not. We have an urgent need of additional income stream now as I am on negative and I need to pay my debts and loans. Our strategy is we will offer our services at 50% – 60% off. In that way we can get a client right away as we will advertise it as a promo only and that they have to make a decision right away if they would like to avail the discounted price. I like the renting option as well, what I have now that I can have for rent is my magic sing, I will formulate a price and have it advertised in our village. I learn some tips on how to manage items based on priority such as wants or needs. I really practice this method. At my age, I will be needing lots of courage to do that. Another easier said than done for me. Hi sir mark! do you have other suggestions for student ? I actually tried an online shop at first it seems to work but at the end it didn’t work. Great article in creating additional income streams. I could suggest for those who are skilled to go freelancing at freelance websites. I did old school freelancing before to augment income however the demands of a steady job in IT takes a lot of time and effort. I’m about to try out as well these freelance websites as I had some time freed up. I will try to give some updates on how it goes. Good ideas, will try to do this. Once again Sir Mark, thank you for showing me ways to earn. Sir, what can I do if I have nothing to sell and zero time to freelance? nice ideas. i wish they will be applicable to me. thanks. Maganda po itong paraan upang madagdagan ang aming kita at mapakanibangan ang mga bagay bagay na mayroon kami. Maraming salamat po makakatulong po ito sa amin. So true. the article clearly presented practical ways of creating other income streams. Nung una nahihiya ako mag charge sa skills ko like repairing PCs and doing PC-related works. But then I realized, since I am spending my time and effort, I might as well earn out of it. I am now learning other skills so that I can make use of spare time to earn and add to my “cup”. Two thumbs upSir Mark for this article!Thanks.